Spring is finally here! The trees are blooming, birds are chirping, and all-around town mowers are firing up for the first time this year. Treasure Valley springtime is incredible! Having a pet in your life has been proven to make you happier and healthier, but deciding to add a furry (or not so furry) pet to your family is a big decision. It’s almost as big of a choice as adding a child to your family. It’s not something you should rush into and ask questions later. Below are a few tips to help you make the best decision so that you, and your pet, can live the best life possible. As of March 2019, Idaho one of only three states that do not allow any kind of CBD (short for cannabidiol) oils to be sold either by the government or commercially. 33 states do allow some form of marijuana (includes CBD oil), and 14 states that allow varying levels of legal CBD oil to be obtained through commercial or medical means. Want Better Overall Health? Get a Pet! About 85 million families across the United States (about 65% of total households) own a pet of some type, and a vast majority of that number consists of cat and dog owners. So, if you’re not one of the 85 million, you have to ask yourself: what’s so great about owning a pet? Does My Dog Have Anxiety? People can suffer from anxiety, obviously, but so can dogs. Any breed at any age can suffer from anxiety and, if left untreated, can lead to bad behavior problems. Let’s go over the causes, symptoms to look out for, treatments and how to prevent anxiety all together. Over the past few decades, Boise has seen a growth of service dogs. A majority of this growth has to do with our booming population, but a small portion of this has to do with people presenting their family dogs as training service, therapy, or emotional support dogs so they can take Fido everywhere. Let's take a look at what the significant differences are in these types of working canines. Despite some snow, it’s actually been an unusual winter here in Boise. In December we were hitting close to 50 degrees some days, now in February, we've been averaging just above 35 degrees. We’ve been very fortunate, especially those of us who have furry friends that can’t wait to get back outside! But those colder days can be brutal, especially when our dogs start acting out or acting strangely because they’ve been cooped up inside all day. The good news is that there are many positive activities you can provide your dog with so that they stay as their usual, happy and healthy selves! When is it Too Cold For Your Dog To Be Outside? As a dog owner, it’s important to understand the differences between what you can handle versus what your dog can handle. For example, just because your dog is covered in fur doesn’t mean that they can handle cold weather better than you. 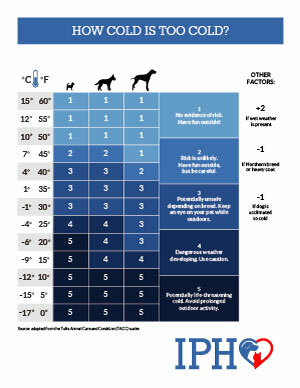 Bigger dogs are better at coping with low temperatures outside than little dogs are, but even they are still at risk. In this blog, we’ll cover what temperatures different-sized dogs can handle and which ones are potentially dangerous, as well as how to identify the symptoms of hypothermia and gauge the need of a visit to the vet. Is the Cost of Cleaning Your Pets Teeth Worth it? Our pets can’t verbally communicate when their teeth ache, or when it hurts to chew. And you can’t usually tell that your dog has dental issues until it has gotten to a serious point. If you ask your veterinarian if they recommend a dental cleaning, the answer will always be, “Yes.” Always.